This time of year, the outdoors beckon, and you can’t find a much better spot for enjoying great food on a sunny, breezy afternoon than Ocotillo, at the corner of 3rd Street and Flower. 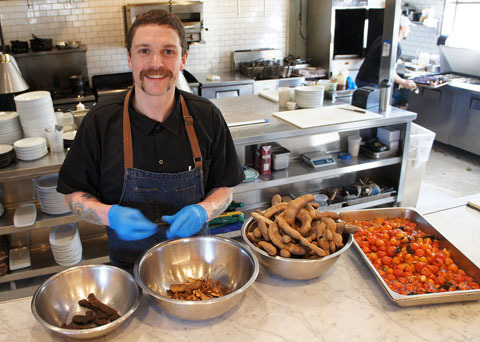 Chef de Cuisine Brendan Lee from Ocotillo Restaurant preps tamarind for a puree with warm spices and dates that will be served with green mole over grilled acorn squash, while a tray of roasted tomatoes and garlic cools nearby (photo by Teri Carnicelli). A standout example of the urban/industrial school of restaurant design, Ocotillo combines corrugated metal, stained rough woods, glass and stainless steel in a chic setting complemented by ample patio seating in a beautiful combination of grass and desert landscaping. The menu is shepherded by Chef de Cuisine Brendan Lee and Executive Chef Walt Sterling. Lee, who joined Ocotillo a month after its opening in September 2015, took on his current title about a year ago, when co-founding chef Sacha Levine left to open her own restaurant. While not being a vegetarian/vegan restaurant, this is a great destination for folks who are seeking innovative takes on the discipline. But not all is vegetable on Ocotillo’s extensive menus. There are luscious combinations to appeal to any meat lover: pappardelle with beef ragù, and Duroc pork shank a Whistle Pig Rye jus. These are in the “large” section of the dinner menu, and they mean large, which means ample leftovers if you don’t share. A thoughtful wine list, compiled by co-founder Dave Johnson, offers plenty of choices for pairing. The spacious bar serves up more than 20 beers on tap along with signature cocktails and an extensive collection of top-label spirits. Ocotillo is a great spot for lunch, especially on a sunny day when the pet-friendly patio beckons. Small plates and salads stand out here, notably the ahi tuna topping a salad of cucumber noodles and avocado, and the house-smoked salmon served on a wood plank with dill crème fraiche and capers, a perfectly dressed small salad of baby greens, house-pickled shallots and lots of toasty bread. It’s perfect for sharing as an appetizer, or for one as lunch. Lee’s interest in cooking professionally began in college, at UC-Santa Barbara. His training took a traditional path, working his way up, learning from chefs rather than in culinary school. After several years, he moved home to Phoenix, working with his father while he followed another path popular with young would-be chefs—cooking pop-up dinners. “It’s fun and a great way to build a market and a following without a lot of overhead,” he says. Eventually Lee missed working in a restaurant kitchen and joined Ocotillo. “It’s the only restaurant I’ve worked at in Arizona,” he says. “I live just down the street and was looking at restaurants around town. I read the menu and ate here and was interested by that and the design as well, so I talked to the owners. It’s worked out pretty well. The menu changes with the seasons. Standout dishes that have remained include smoked, wood-fired beef ribs with mole-espresso barbecue sauce, and mesquite-grilled Ocotillo chicken with a citrus-fennel-honey sauce with pecans and served with date-potato salad. Vegetable dishes that remain customer favorites include smoked beets with herbed ricotta, arugula and honey, and cauliflower with kale pesto and lemon-Aleppo vinaigrette. Also the roasted sweet potato with pasilla-pumpkin salsa and avocado is a perennial favorite. Ocotillo’s urban industrial vibe melds seamlessly with an outdoor area that offers several choices for dining and dawdling. The beer garden, open to the breezes, has its own bar and faces a grassy area with a structure at the end that can serve as a stage for live music, or a screen for outdoor movies. Across the compound in a smallish structure that used to be a coffee bar, Sidecar lounge serves up cocktails. The Ocotillo group has expanded, with another location, Chantigo, opening sometime this fall near 10th Street and Camelback Road. The menu will be “fairly eclectic Latin,” Lee says, with a lot of Peruvian, Central American and South American offerings. Ocotillo is located at 3243 N. 3rd St. and is open seven days a week, with brunch served on weekends. For more information, call 602-687-9080 or visit www.ocotillophx.com.